- Just clicking an image preview to see it (clicking the little magnifying glass on the image, in the list of attachments) attempts a download of the image. I'm just trying to see the image larger, not download it. - When clicking that magnifying glass OR clicking the little menu on the attachment in the attachment list, two things happen - the Freedcamp app pops up a window with a file dialog to save the file AND Chrome (my default browser) ALSO pops to the foreground and then auto-downloads the attachment. 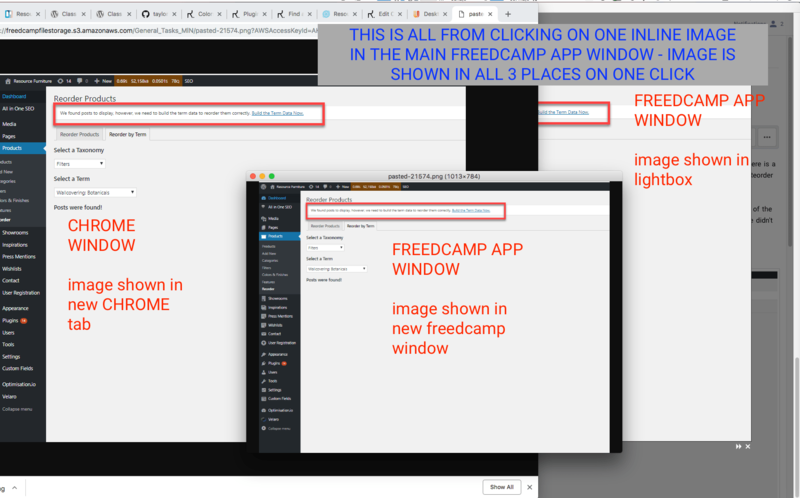 - Lastly, when clicking an inline image, in addition to the desired behavior (opening the image in a lightbox), the image also opens in a new freedcamp window AND Chrome pops up a new window. This is super-annoying - I have 3 images to close in 3 different places as opposed to just hitting "esc" to dismiss the image. Auto-refresh - I shouldn't have to hit cmd-R to see if there's anything new or not. Clicking the update notification link "Please download and update from here" continually spawns 100s of new browser (IE11) windows (pointing @ https://desktop.freedcamp.download/) until either I kill Internet Explorer or Internet Explorer kills my machine. Pop-up notifications from the desktop app for tasks would be great. Or at least a little icon indicating new content. Also, it would be great to check off a box to stay logged in all the time, not just 2 weeks since my password isn't autosaved in the app. Got another small bug on the Mac version. If you opt to download a file that's attached to a task, a file browser window pops up and you can select where to save the file. It works fine if you continue and save a file. If you cancel out of the dialog, the dialog box closes, but the app freezes at the "pulsing"/loading indicator. At that point you can either quit or hit cmd-r to "reload" the app. Begging for OS-X notifications, it's really one of the main reasons I'm here for the desktop app. @Mike, I guess you will need to talk to IT department to install Freedcamp application to required people computers in a centralized way but please wait when an application is properly signed by us. My organization does not allow the Windows Defender Block to be bypassed. Are there any other options to install this? Why isn't there a link to the desktop application anywhere on your main page? Why does the app look exactly the same as the browser version? Most desktop apps are a miniaturized version of the browser version. Take toggl for example.. it has just the timing aspect not all of the functionalities of the browser version. This makes it much easier to use/keep on the screen. I have not used the Freedcamp desktop app since the first 10 minutes after downloading. 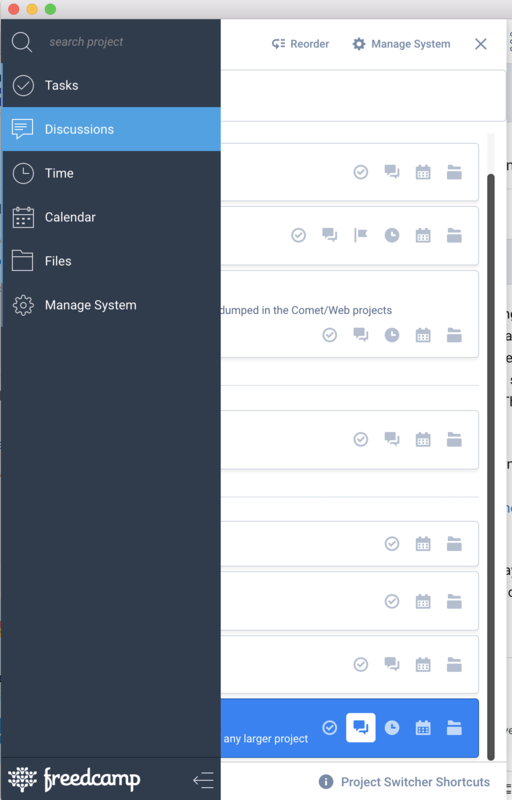 - Kind of related, I'm running this on two desktops and it looks like I have to manually refresh the app (splat - r) to see new tasks in a project - can we have the app poll for changes? This is great, well done. Can you make it so that clicking on the icon in the dock (on Mac) opens the main window if the window closed, but the app is running? @Charles - thank you. It has been already reported and we will update with the fix soon. Sorry - no Linux version. If there are enthusiasts who will be interested to create one - you will have our full support! Hi, this new version looks to be working better! I tend to use this instead of Freedcamp in the browser. I hate to harp on keyboard shortcuts, but could you also add Hide (Command + H) and Find (Command + F)?